New Delhi [India], Sep 18 (ANI): And it's out! The much anticipated first look of megastar Amitabh Bachchan in 'Thugs of Hindostan' is sure to give you goosebumps. New Delhi [India], Aug 21 (ANI): From megastar Amitabh Bachchan to Mr perfectionist Aamir Khan, stars have come in unison to laud wrestler Vinesh Phogat, who bagged a gold medal in women's 50 kg freestyle wrestling category at the ongoing 2018 Asian Games. Chandigarh (Punjab) [India], Aug 2 (ANI): Cricketer-turned-politician Navjot Singh Sidhu on Thursday said that Pakistan Prime Minister-in-waiting Imran Khan's invite for the oath-taking ceremony is a personal one. Islamabad [Pakistan], Aug 1 (ANI): Former Indian cricketers Sunil Gavaskar and Navjot Singh Sidhu, along with actor Aamir Khan have been invited by the Pakistan Prime Minister-in-waiting Imran Khan for his oath-taking ceremony. New Delhi [India], July 26 (ANI): Aamir Khan's home production, Aamir Khan Productions and T-Series are all set to release a movie based on the life of music composer the founder of the T-Series music label, Gulshan Kumar. New Delhi [India], June 19 (ANI): Famous for the song 'Aati Kya Khandala,' Aamir Khan and Rani Mukherjee-starrer 'Ghulam' has clocked 20 years of its release. 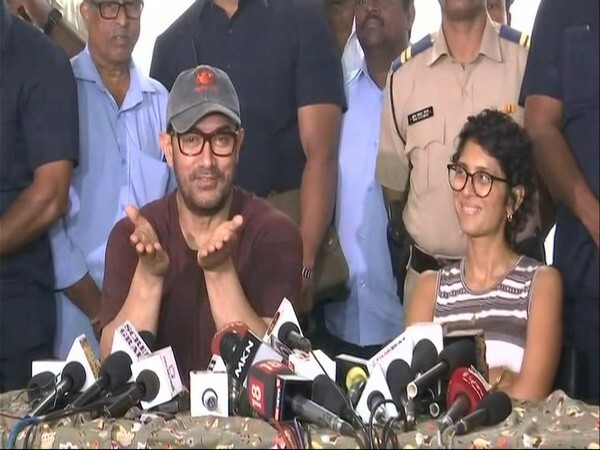 New Delhi [India] Jun 15(ANI): As the most-awaited action thriller, 'Race 3', hit the big screens today, Bollywood star Aamir Khan poured in wishes for his 'Andaz Apna Apna' co-star and the film's Race 3 lead hero, Salman Khan. New Delhi [India], May 30 (ANI): Megastar Amitabh Bachchan is all set to don the host's hat for the tenth season of 'Kaun Banega Crorepati'. Latur (Maharashtra) [India], May 1 (ANI): On the occasion of International Labour Day, Bollywood stars Aamir Khan and Alia Bhatt undertook 'shramdan' - also known as contribution of labour - in Latur, Marathwada here.